Nepal is rich with cultural heritage, as shown by its many monuments. This edition of our ongoing series of archaeological and historical sites of Asia will focus on Nepal. Nepal suffered a devastating earthquake last week. In addition to the loss of life and property, many of Nepal’s historical treasures were damaged. Nepal and the greater Himalayan region are unique in South Asia for their preservation of monuments and manuscripts that have survived in these regions for much longer than in the hot, damp plains of northern India and Pakistan. Below, I discuss some of Nepal’s most interesting archaeological sites. Many of Nepal’s most important historical sites are found in the Nepal or Kathmandu valley, which lay on the major trade route between the Ganges valley in India and Tibet. In the city of Kathmandu, there are multiple temples and palaces built in an architecturally distinct style from Hindu temples in neighboring north India, with the distinct pagoda-like features more prominent in eastern Asia. Many of these structures were severely damaged by the earthquake including the temple of Kasthamandap, a squat temple from which the city takes its name. Kathmandu’s Durbar (palace) square was filled with rubble and ruins after the earthquake though some pagodas survived. 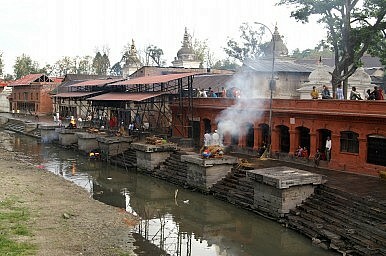 The most important and oldest Hindu temple in Nepal, dedicated to Shiva, Pashupatinath Temple near Kathmandu (from around the fifth century C.E.) has survived and is now the site for the cremations of many victims of the quake. Kathmandu’s sister city of Bhaktapur, also in the Kathmandu valley, fared much more poorly. Bhaktapur has fewer modern buildings that can withstand earthquakes as it is more medieval; the city was also closer to the earthquake’s epicenter. Reportedly, over 80 percent of the temples around Bhaktapur’s Durbar Square were destroyed, including the famous Vatsala Durga temple. A third city in the Kathmandu valley, Patan, suffered relatively less damage than Kathmandu and Bhaktapur. Nepal also has multiple important Buddhist sites, including the town of Lumbini in southern Nepal near the border with Uttar Pradesh in India. The historical Buddha, Siddhartha Gautama, was born there. Another Buddhist site of note in Nepal is the Boudhanath stupa near Kathmandu. Many Tibetan refugees have settled near here and constructed monasteries around the stupa. Also in southern Nepal is the city of Janakpur near the Indian state of Bihar. This city is well-known as the birthplace of Sita, wife of Rama, the seventh major avatar of Vishnu in Hinduism. Sita is famous for being kidnapped by Ravana, the king of Lanka, which lead to an invasion of that island led by Rama and his ally Hanuman. A special mention must be given to the almost otherworldly erstwhile Mustang (or Lo) kingdom, which was featured in a photo essay by The Diplomat in 2014. Mustang, located in in far northern Nepal, was a Buddhist tributary kingdom of the main Nepalese kingdom, until the Nepalese monarchy was abolished in 2008. It was founded by a warrior in 1380. Its culture is close to the culture of Tibet and is actually located beyond the highest peaks of the Himalayas on the other, “Tibetan” side of the mountain range from the rest of Nepal (most of which is on the “Indian side” of the range). Nepal’s archaeological heritage, especially from the medieval period, is relatively intact. As Nepal recovers from last week’s earthquake, let us hope that the country will be able to protect and restore damaged sites in the Kathmandu valley and preserve its cultural heritage for years to come. The world can learn from Nepal’s community-oriented approach.